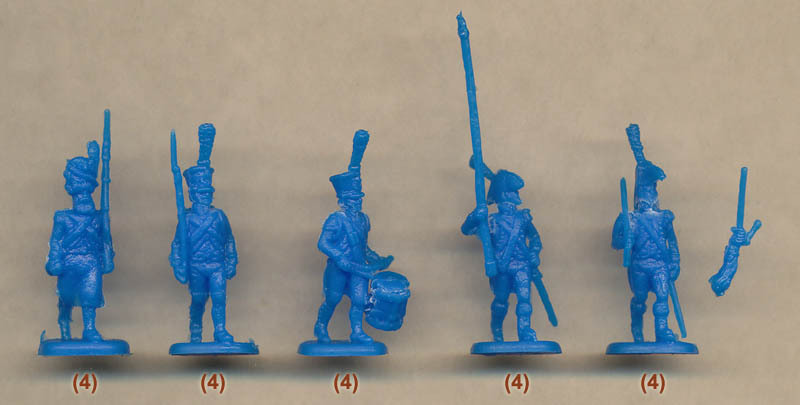 This set of figures could more properly be described as a collection of parts which can be used to construct some of the command and specialist roles for most of Napoleon’s armies. The sprue offers us a daunting array of body parts and tells us that there is a lot of work ahead before we can get some recognisable miniatures. Once that work is done we will have six figures from each of the four sprues here, so when the box says 92 pieces it really means pieces, as there are enough to construct just 24 figures. The first of our pictured figures is also the easiest, because he alone is already complete. The only man here with a head and both arms, he is a sapper on the march. His trademarks are clear for all to see, being his apron, cased axe slung on his back, and the grenadier-like bearskin on his head. Usually this had no plate, but the one here looks a bit like it might have one, although this is so vague as to be easily ignored and overpainted. The bearded sapper seems to have two crossbelts, but between them they seem to support his combined sabre/bayonet frog, a cartridge pouch and his axe case. It is not clear what is supported by what round the back, and the large pouch is in the middle, so it appears the sculptor was not clear on this either. All the rest of the figures in the set have no head, but for each five headless bodies the sprue offers us a generous selection of nine heads wearing either a shako, a large hat (bicorn) or a much smaller one. The second pictured figure has been given a shako by us, largely arbitrarily, since the others would also have sufficed. This figure is an NCO, marching with his musket in his right hand, and is dressed much like the ordinary troops, with the open pre-1812 habit coat and gaiters to above the knee. He wears a pack which is a separate item that fits onto a peg on his back, but this is fairly lose and requires gluing. This piece also has a sabre, but strangely no bayonet scabbard (despite there being a bayonet fixed to his musket) and also no pouch. The shako head used here has a long plume such as might grace a grenadier or voltigeur, an indistinct badge and no cords. Third in our line-up is a drummer. It all seems to have gone quite wrong with this one, and we will start with his drum. This is a separate piece, or more correctly two separate pieces which must be glued together and then glued onto a peg on his leg. The fit of the drum halves is poor, and the positioning on the leg much too low, being partly below the knee and so impractical. This man has two belts over the right shoulder – the first supports the drum and the second, well the second sort of meets the tails of the coat and then disappears. He also has the straps for a knapsack, but no knapsack, nor any means of fixing one even if there had been one supplied. Looks like a design where minds changed a lot during development and the result is quite a mess. Number four is the man charged with carrying the eagle, quite literally since there is no flag attached to the staff. This was quite common practice when on campaign, and allows a paper flag to be added if desired, which many people prefer to do anyway. Like all the pieces in this set the eagle is quite indistinct and not a great sculpt, so a close inspection does not show the best of these men. For our flag-bearer we chose a head with a small hat, and also had to attach the right arm clutching the staff, which is separate. The fit of both separate items is not firm and requires gluing, and the traditional plastic used here means ordinary poly cement is not particularly effective, so we used cyanoacrylate glue, which works well but causes the white marks you see in our picture. In particular all the heads have a hole drilled up the middle, and all the bodies have a peg on the neck. The head fits snugly on this peg, but then pops off again so has to be glued to stay put. A fractionally smaller peg would have been preferable here clearly. Lastly we have two officers, one on foot and one mounted. Both have no head and no right arm, and we chose the large hat for each, and for the right arm, of which there is a surfeit, we chose one extended and one with sword resting on the shoulder. The same issues about fit and ease of assembly apply to these poses as to the others. The foot officer has the standard coat and wears boots, but the mounted man wears the popular surcoat. Both are otherwise largely unadorned, but either or both may have a gorget at the throat – we simply cannot tell, which speaks loudly about how vague the sculpting is here. The horse (which does come with head attached) is in a decent walking pose and is properly equipped and dressed for such an officer, who fits astride the animal very nicely. As we have said, this is not the easiest set to work with, but on the whole the resulting figures are correctly done and in useful marching or walking poses. The drummer is the weakest of the bunch with the extra straps and the poor drum, and there is some flash here, which may well be responsible for the failure of the heads to stay on their pegs. It is a small set, but then few require large numbers of such figures so this is easier to accept. The definition could have been a lot sharper, so these are passable rather than great figures, but if you don’t mind some careful work to make the most of these then they have considerable scope for variation and conversion, and would certainly fulfil the needs of those bemoaning the lack of such figures in ordinary general infantry sets.